This is a simple Jar Pack program. You can use it to compress files or directories from your computers in a single jar file. It can be also used to extract an existing jar or zip file. The Jar Pack program has a very simple user interface which is divided in to two sections or parts. 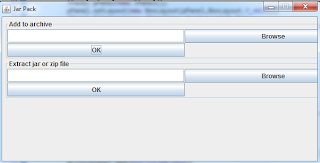 In the first section, there is a text box that you can enter the file or directory path to compress. Alternatively, you can click the Browse button to select a file from your computer. The file chooser allows you to select only file item. The selected file path will display in the text box. If you want to compress the directory that contains the file, you simply need to remove only the file name from the text box. You will press OK button to start compress the file or directory. The second section is similar to the first section except that it is for opening or extracting an existing jar or zip file. The Jar Pack program uses the Apache Tika library to detect the mine type of file that the user selected to extract or open. Since this program is able to extract jar or zip file format, only a jar file or a zip file is allowed to extract. You will need to add the Tika library to the Java Build Path in Eclipse (Project->Properties->Java Build Path->Libraries->Add External Jars...) before you run the program. In Java, creating jar and zip files are almost the same. The difference is that to create a jar file, you need to use the JarOutputStream class to write the content of the jar output file. Creating a zip file requires you to use the ZipOutputStream to write the content of the zip output file. Please read the Create Zip file page to read code explanation on compressing files and directories in zip file. Opening or extracting the jar file and the zip file are the sample so that you can read the code explanation about extracting a zip file on page Extract Zip.